The Los Altos Hills market mimics the Mountain View, Los Altos, and Palo Alto with regards to median price only. Its market data of MSI, DOM, and sales absorption are different than the other markets due to its extremely high price range driven by its premier location and exclusive homes. Like other Bay Area markets, Los Altos Hills should continue its upward trends, though it will probably be one of the first markets to feel the effects if trends begin to change again. Due to its higher median price range of $2,376,000, the inventory levels of Los Altos Hills fall into that of a more balanced market, and even at times a buyer’s market. The May 2012 level of inventory is currently sitting at 2.5 months which is a drop of almost five months from April 2012. The DOM for Los Altos Hills is not cyclical like Mountain View or even Los Altos due to the extremely high price range and more exclusive properties. 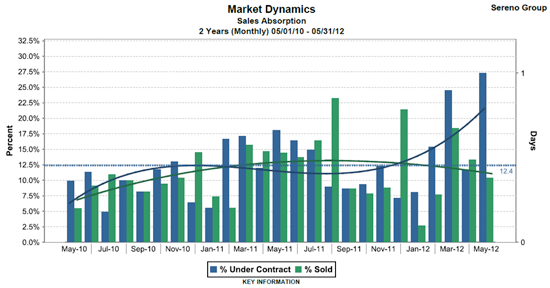 The chart above reveals that the sales absorption rate for Los Altos Hills was unsteady between May 2010 and May 2012. The fluctuations such as this are to be expected at this more exclusive price range. In May 2012, the current sales absorption rate was 27.3% of properties under contract and 10.4% of properties sold. 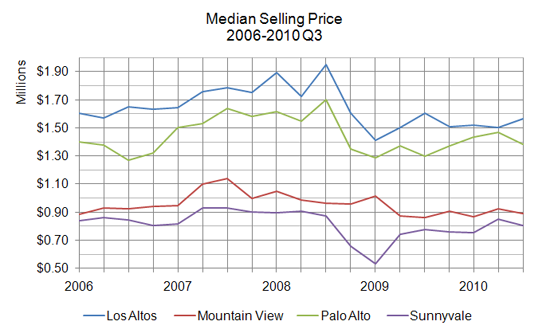 The median sales price line for Los Altos Hills more closely follows the line of Mountain View with a slight uptick in late 2010 and a dip until September 2011. At that point, the uptick pace for Los Altos Hills more closely follows the pace of Los Altos. As shown in the charts shown below, Los Altos is a highly desirable city with a strong market and high median price range. While it does border into a balanced market occasionally, Los Alto is to be considered predominantly a seller’s market. Given its average median price range just under $1.6 million, it is surprising that the average DOM is under 30 days and the inventory supply is just about 1 month. With the consistent upward trend in sales absorption and median price since September 2011, we can expect Los Altos to maintain its status as a desirable place to live and will most likely see prices continue their upward trend. The chart shown above graphs the MSI as well as the DOM for Los Altos. The chart indicates greater fluctuation in DOM statistics when compared with those of the Mountain View market though Los Alto does still follow the seasonal real estate cycles. Currently, the DOM is between 20 and 30 days, and the level of inventory is currently sitting at just over one month. As with MSI, the sales absorption rate has also been fluctuating a bit more when compared to Mountain View though it has been trending upward overall from May 2010 to May 2012. In May 2012, the current sales absorption rate was 46.3% of properties under contract and 40.7% of properties sold. 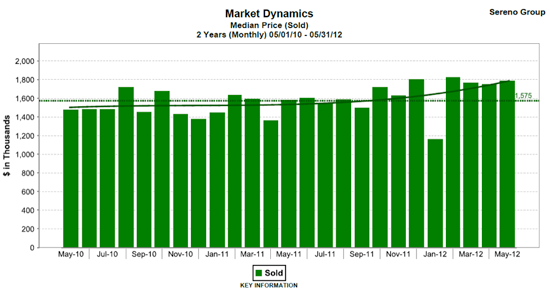 The median price in Los Altos is showing a healthy, and likely sustainable, upward trend over the last two years. When discussing Mountain View, Los Altos, Los Altos Hills and Palo Alto, Los Altos is the only market that did not see a dip in late 2010/early 2011. Since September 2011, this upward trend has become a bit more pronounced with the median price in May 2012 being $1,786,500 which is more than $300,000 higher than May 2010. Los Altos burned through the summer months of the second quarter this year as it showed strong signs towards a sustained housing market recovery. The median sales price slipped 1.4% from the quarter before, to $1.5 million. But the exciting news for home sellers is the precipitous drop in average days on market to 41, from 73 the quarter before, and 98 closed sales, which is equivalent to the same quarter in 2008. The sales price to list price ratio is 98.21%, meaning that more and more buyers are paying closer to list price, reflecting a shift to balanced buyer and seller perceptions. Total sales volume is $160,352,888, which is 17.3% lower compared to the same period in 2008. Overall, Los Altos realized the greatest drop in mean sales price of our four comparison cities and has yet to recover the nearly 13% difference in price from the same time period in 2008 -- meaning home values are still depreciated in the area. Available supply in the Los Altos market hasn't been as low since 2000, when the median number for single-family homes jumped an astronomical 48.9% year-over-year. That year, the number of closed transactions to new listings was almost 2-to-1 (48 closed to 25 new). The headline number this year is that closed sales are the lowest in a decade, but so was the available inventory. Relative demand for what's available has been strong enough to draw notable increases in two key statistics. Only one condo in Los Altos was sold this August and only a handful more in each of the previous years, so their trends and statistics may have a high variance. In single-family homes, though, it wasn't just the fact that the percent of list received jumped from just under full value to 104.31%. The median listing value also increased 4% year-over-year, meaning homes weren't just selling for more, they were starting higher too. The median transaction increased year-over-year as well, from $1,650,000 to $1,782,000 (8%). For July and August numbers in particular, schools play a large role in housing demand and Los Altos schools are some of the best in Silicon Valley. I've worked with people who've made the argument that, assuming that schools are the critical factor in their home-buying decision, paying a premium on a home is preferable to sending their kids to lesser schools, or private schools. To them, private schools may not be as good socially: the kids who they go to school with may not always live nearby or have as varied backgrounds. Premiums aren't necessarily the most financially-conservative route, but choices involving children don't always need to be. Los Altos' first Median Home was the 3,249 square foot family home at 1109 Covington Road in the area known more descriptively than artistically as "South of El Monte". This home is about space with its 4 bedrooms, two family rooms and a 9,583 square foot lot. The master suite is on the ground floor, separated from the guest and family bedrooms. With 3.5 bathrooms, there's no waiting. This 32 year-old home is clean and efficiently laid-out and has hardwood floors in many of the rooms, plus a bonus room upstairs and a separate laundry room. And while the house has a room to fit every need and sometimes more, the amenities within the house are fairly average. Tile countertops and standard period cabinetry in the kitchen match the level of the slightly dated bathrooms. For buyers looking for investment value in Silicon Valley's real estate market (on top of the area) those are very good things. The fact that the kitchens and bathrooms have many years of useful life left, but haven't been upgraded yet (to granite, marble, stainless and all the other requisite trappings for the neighborhood) means that you can wear them out and still have a lot of upside potential for this home. This is in contrast to the other Median Home in Los Altos, 839 Hierra Court, which, at 14 years-old, has all the upgrades and sold in only 8 days for an even $1,800,000. Located near the Los Altos Golf and Country Club, this home features a brightly-lit interior with a design that might have come straight out of Architectural Digest. Considerably smaller than Covington, this 3 bedroom, 2.5 bathroom house measures 2,117 square feet with an 8,200 square foot lot. But this is a home more about prestige and design than space, and given the quick turnaround, the new buyers were not only more than willing to make that trade-off. They also added $152,000, or 9.2%, on top of asking. You'd never know this home was 51 years-old. In the same "South of El Monte" area of Los Altos, but physically closer to Hierra than Covington, this 1,909 square foot home at 1697 Middleton Ave. boasts not just a pool and spa on its 10,454 square foot lot. Its completely-remodeled interior features consistent use of black granite in both the kitchens and bathrooms and a design that evokes classic New England, even with the LCD TV mounted above the centerpiece fireplace separating the living and dining rooms. Middleton's part of Los Altos is actually served by the Cupertino Union School District, which is also renowned in and outside of Silicon Valley. This home went in 13 days at $52,000 over the asking number of $1,598,000. 54 single-family homes and 12 townhomes and condos are currently available as of today. Out of the 54 single-family homes, one dozen have had a published reduction. That number isn't news in either direction. One home is a tear-down that has some potential. Two of those homes are new construction. When a small or inexperienced developer has locked in on a number in their minds --- sometimes they understandably overvalue "newness" or build pride into the value --- they're often reluctant to negotiate early on, or scare prospects away with a valuation that isn't market-driven. The Active CDOM for single-family homes in Los Altos is 64. If you throw out the properties that have been on the market for 318 and 407 days, the Active CDOM number drops to 53. The average CDOM for properties that sold is 38, which is a pretty good indicator for when owners should be seriously considering more latitude in their pricing.